the Recreation Area has the best views of the bay. We have a 9 hole mini-golf putting green and crazy golf. For the more energetic person there is a full size tennis court for you to play on along with a basket ball court and I play game for the children.for a more gentle life we have a large smart bowling green. Finally we have an skate Park play area and lots of benches so you could just sit and relax as the day passes by. All the equipment can be hired from the ticket office We look forward to seeing you on either the mini golf courses or one of the other activities on the site. We are open daily from 10am with the last ticket sold an hour before closing at 7pm during peak times and at 5pm off peak times – weather permitting Please contact us for any special requiments that will increase you enjoyment of your time in Grange Keep watching this site as new and exciting activities are planned for the season and beyond. Please note ALL times are subject to weather conditions. To be sure we are open please contact us before you visit. 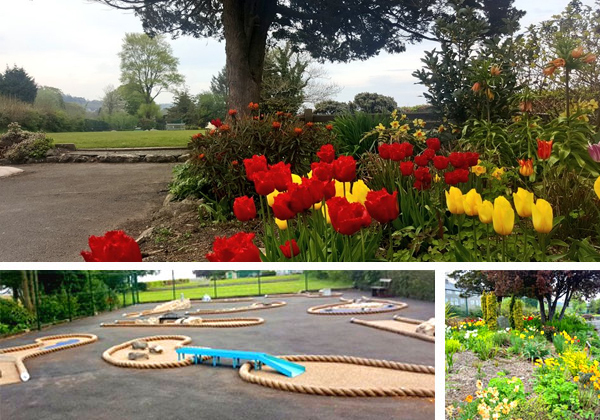 Copyright © Grange Promenade Recreation Park. Website management Whitesands Media.